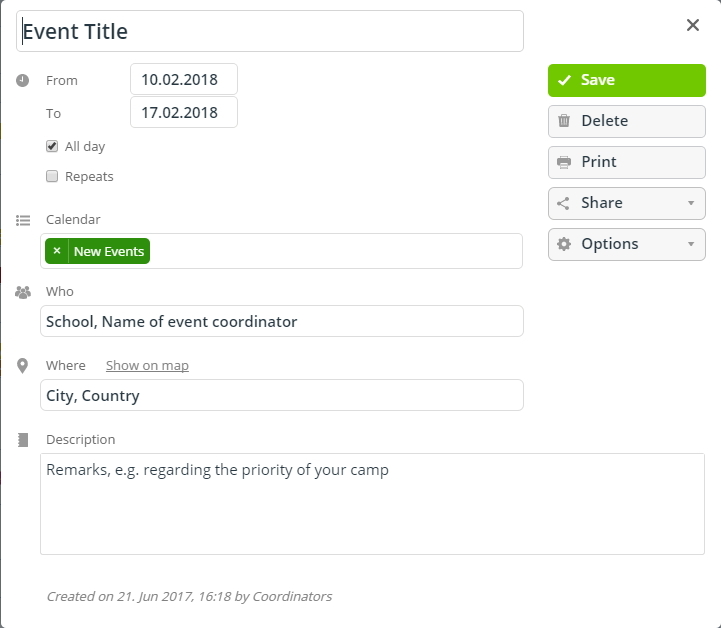 To add an event, simply click on a date in the calendar. Choose a title, start and end date, select “All Day” and “New Events” category if not yet active. Enter the name of the school and of the event coordinator into the “Who” field, and your city and country into the “Where” field. In the description, you can leave remarks for us. Confirm with “Save”. You can later on select the event again to change entries or delete it. Please don’t use the “Share” function. We have finetuned the categorization of event priorities. The main priority contains the most important big international camps, and no other event is allowed to overlap with them. Priority 2 is the teacher trainings that are also to be organized in a way to never overlap with each other. 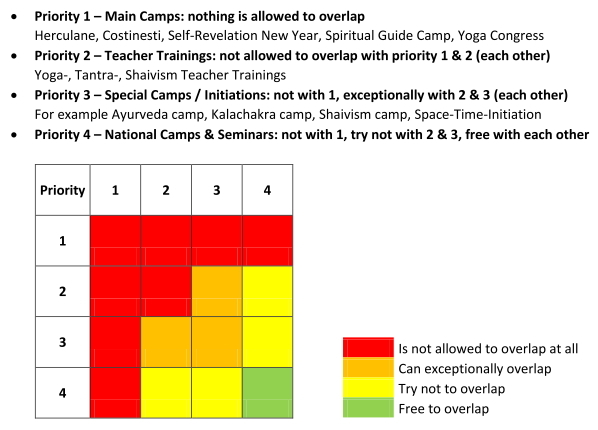 Priority 3 are unique special camps and initiations, that can only in very rare exceptions overlap with each other or teacher trainings. Those exceptions have to be confirmed by our spiritual guide. Prioritiy 4 is all the national camps and seminars for which students would less likely travel, therefore they can freely overlap with other national activities, yet they should at least try to not overlap with important other events. Enjoy the planning of your great events, and thank you for your contribution to a harmonious international coordination.